I only just got myself out of my pj's even though I've been sewing and cooking most of the day. 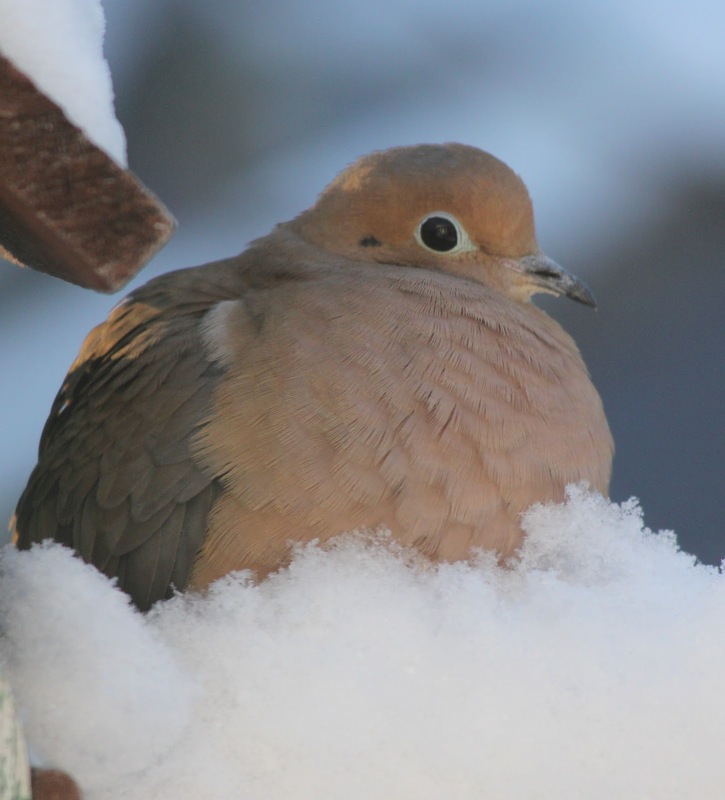 We've got a bit of a winter storm going on outside right now, so no need to get dressed. We planned a quiet New year's at home which works out well. We'll likely watch a movie and have a special treat or two. I might leave the blinds open for a while to enjoy the last of the Christmas lights and perhaps we'll be able to see the snow falling in the glow of the lights. I've read a few blogs today where the authors very nicely expressed their thoughts about New Year's here and here. I don't think I could express myself nearly as well and they were very much how I feel. At this point in my life (56), I don't need the stress of any lofty goals, but at the same time I don't want to just drift or flow along like a stick in a stream with no destination. I remarked on one blog that I am somewhat like a river because I pick up all sorts of bits as I flow along in life taking on new things all the time. I don't really see anything wrong with that as long as I can keep on growing as an artist and as long as I try to stick to my own vision. It means to my bloggers though that perhaps I haven't developed a truly distinctive style although I think I'm getting there. 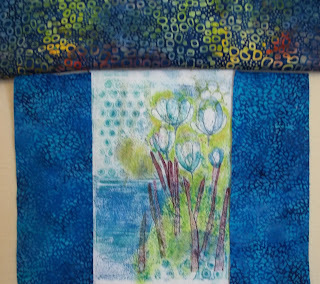 I am a mixed media kind of gal though, so I can not have goals that restrict me to one thing. I just want to keep experimenting and developing my creativity while adding to my tool box. 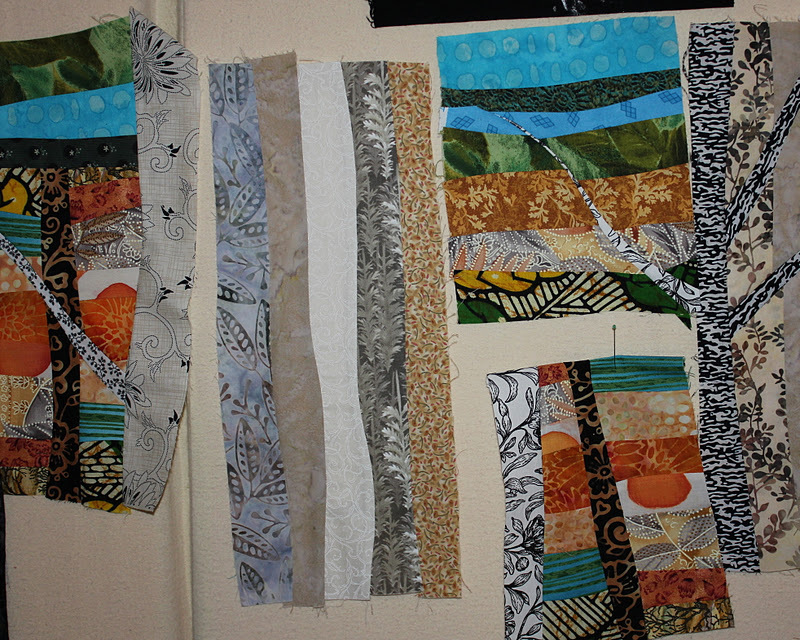 Which is kind of what I'm doing with the free form piecing method I'm experimenting with now. I love Rayna's work, however, I don't want my work to look like hers. So, I'm learning the methods and trying to take it in my own direction. Last night, I thought it was a mess when I last looked at my pieces. 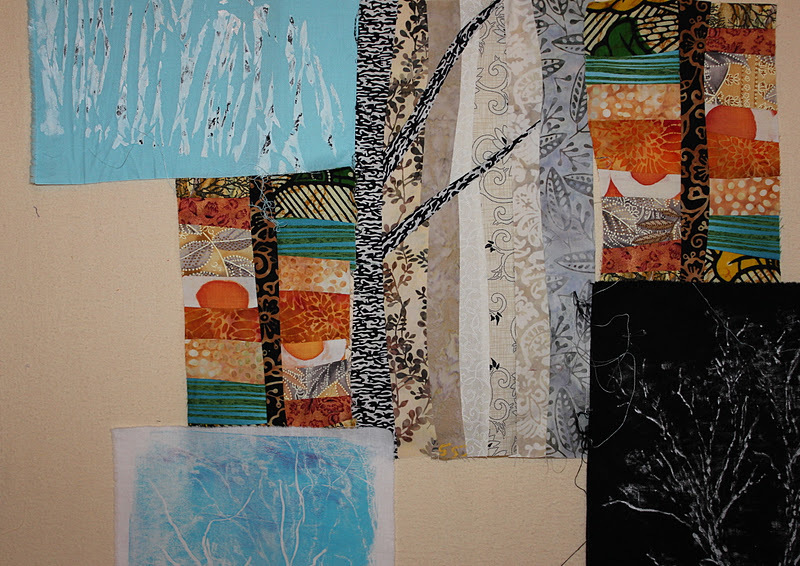 This morning, I moved it around and pieced a few more. I was excited; it is a really fun process and no matter how hard you try , fabric bits end up everywhere! That's a little out of my comfort zone. I do a little, straighten up a bit, and then continue. Again, now I'm at the pint where I think it's a mess again. I think it's a process where I'll have to work on something else in between to keep it fresh. I know it looks a lot like what I've done already. I have added some bits though. Do you see any coherency at all? I need to make more strips, some quiet ones and then figure out how to fit it together. I spent a good deal of time flipping through fabrics at the Ft Quarter Shop for a new contest at Quokka Quilts. Just follow the link for the directions. I was inclined not to do this as I knew it would take time and I wasn't sure I could actually figure it out. Basically you choose 12 prints plus 3 solids from the shop, save them to your computer picture files. Then you can make a mosaic in Picasso or another online mosaic maker. I had to make quick choices or I could have been there all day! Today is my day to go out to lunch and I'm happy I don't have many errands to do because it's windy and very cold. 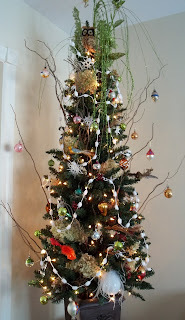 I may take my tree down later as my son left today and we are once again on our own. I would like to have it all cleaned up before New year's Day as I like to start the New Year doing what I love to do and not housework. Well, I'm following Rayna's directions, continuing to strip piece, and I'm throwing it up on the wall. I'm not sure if anything will actually go together. I just got home form spending some fun sewing time with a friend. I don't normally get to see her other than at UFO day because she works full time. At our last day, though, she mentioned that she had Monday and Tuesday off, that her husband had to work and maybe I'd like to join her. Once I knew my company would be gone, I accepted. 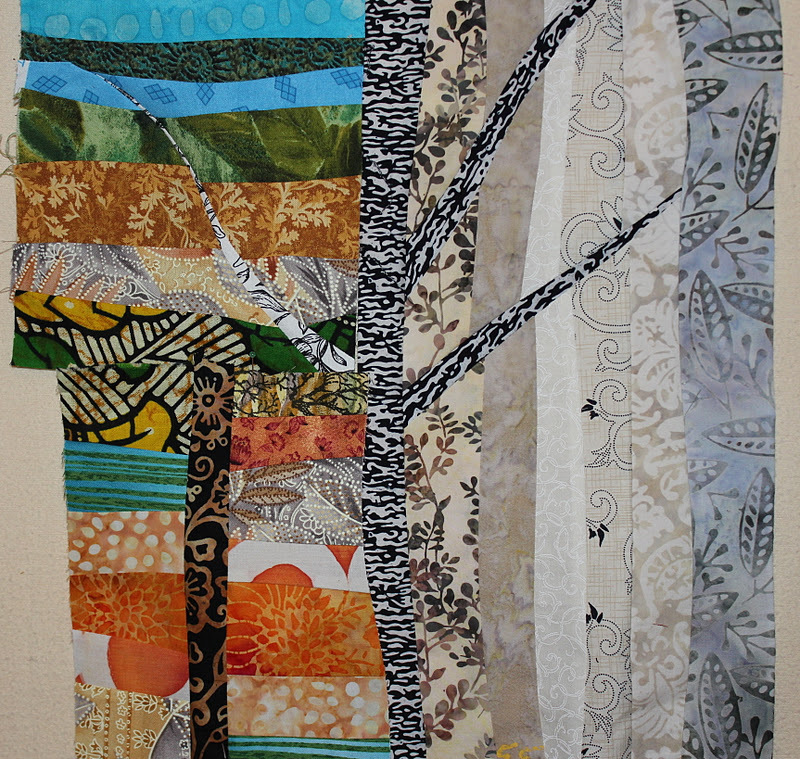 This is one of Charlotte's landscapes--of Quilted Chaos -- that hangs in her studio. She made me a cell phone case today which I didn't take a photo of; she sells them in her Etsy shop. Then she made this little stuffed airplane for her nephew. 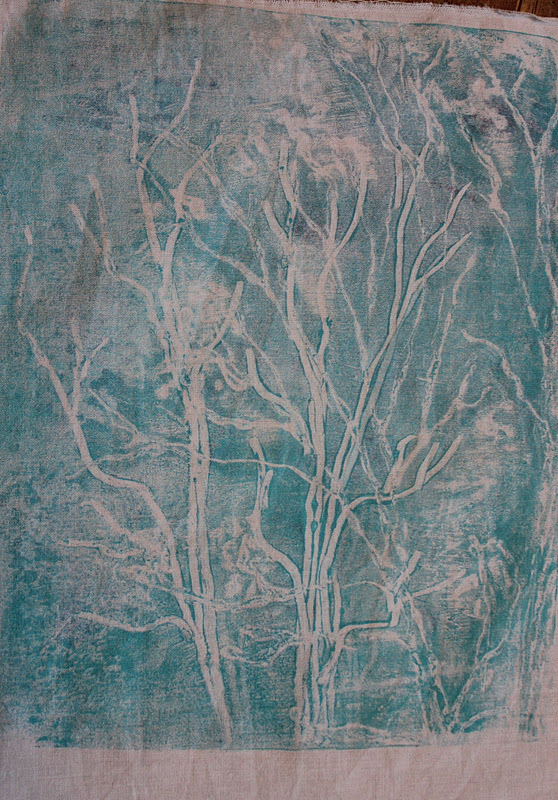 As you may know, I've had a bit of a fascination going on with birch trees. 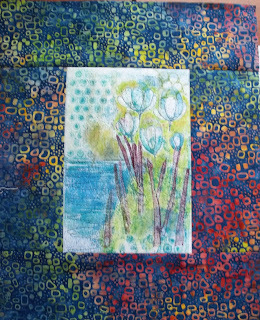 I've been working on different methods to depict them and when I sat to re-read my new book Create Your Own Freeform Quilts by Rayna Gillman, I thought it might be fun to use the techniques from the book. 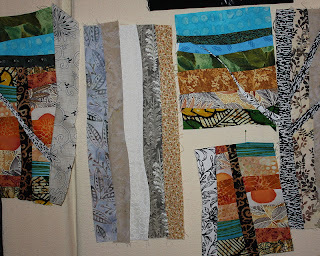 Using Rayna's method, I strip pieced a couple of sections and I've laid them up on my design wall with a couple of the painted pieces I just did. The painted pieces will likely end up incorporated into the hanging in smaller pieces. I'm just getting started but I like where it is going so far. 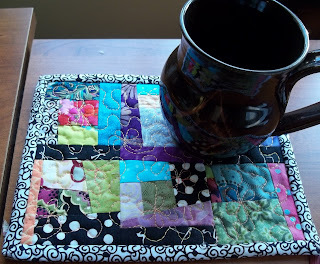 I'm linking to the WIP Wednesday at the Needle and Thread Network. We had a successful Christmas dinner for 15 yesterday--managed to find the space for everyone and accommodate both the vegetarians and the meat eaters. For the vegetarians, I used filo dough and a veggie loaf recipe to make a roll up loaf which went from the freezer to the oven. Everyone liked it. We had turkey with all the trimmings for the meat eaters. My youngest son and his girlfriend went off to her place for dinner today. We went for a walk on the trail with my eldest son and his fiance before they left after lunch for her home near Moncton. 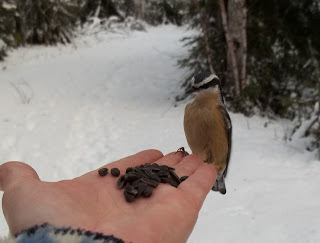 We attracted lots of birds to feed from our hands. 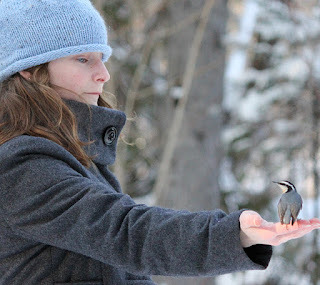 The nuthatch seems to be studying my son's fiance in the second picture. 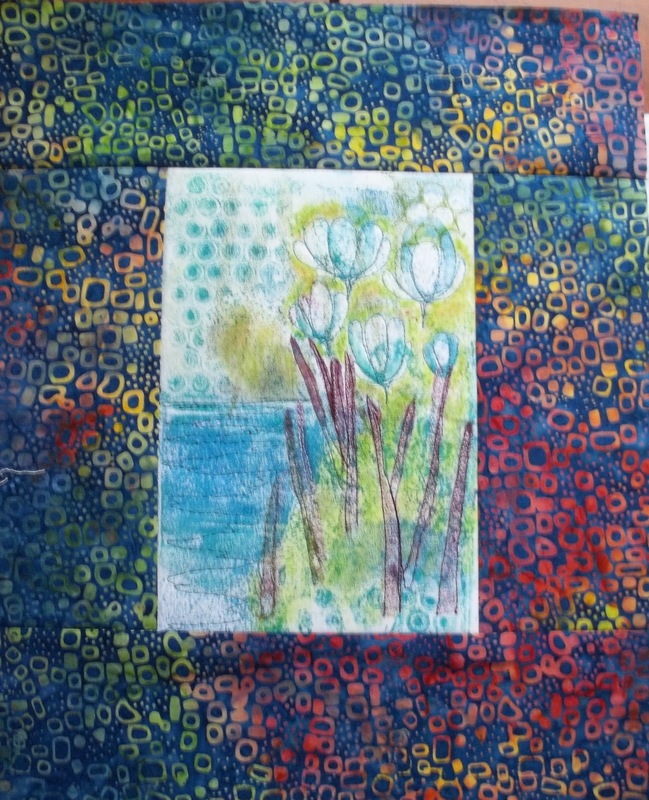 Once they left, I threw in some laundry and then set up my paints and fabric for a bit of gel printing. 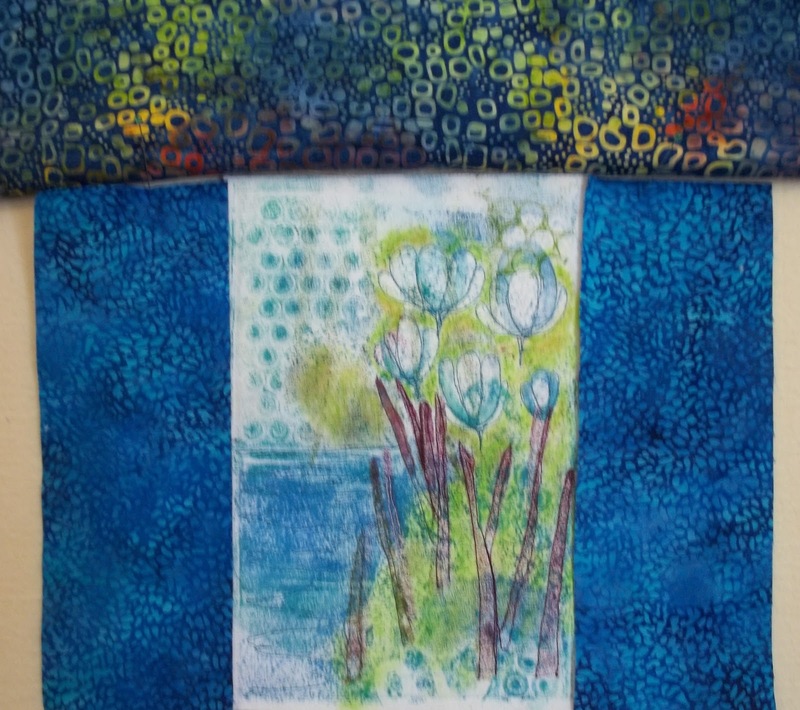 I did 2 gel prints and 2 shibori type pieces. The shibori pieces are done by wrapping the fabric around a cleaned tomato can. As you wrap it round and round with string, you gradually push the fabric down until you get the whole piece all onto the can. 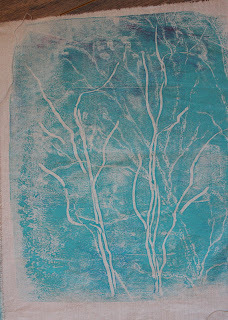 The you paint it with fabric paint using a sponge brush. 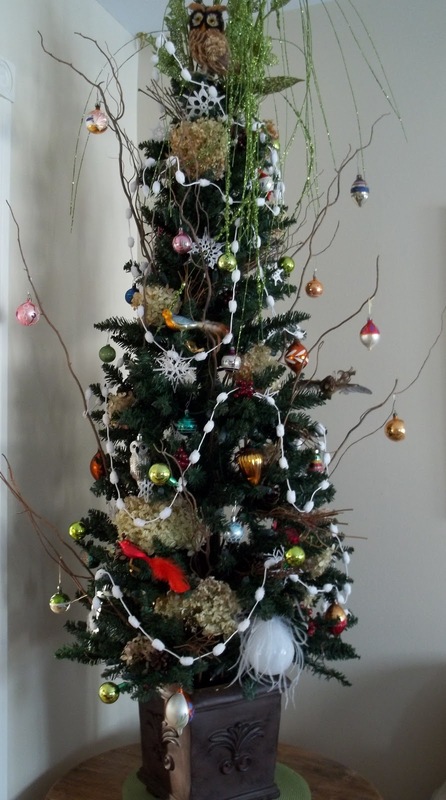 I also tried to do some diagonal wraps with the string, hoping that I would get the hint of branches. When my husband came down the stairs he said "those look like birch trees", so I think I got what I was going for. The next 2 pieces I printed using a gelatin mold. Often I do many at a time but I only had so much time and energy today. 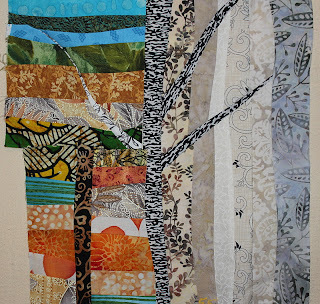 I'm doing as many pieces as I can in the birch tree theme in hopes of combining them all into one piece. I plan to go warm up leftovers for supper and then to relax this evening. Well, I didn't expect to do another post until after Christmas, but the turkey is done, cut up and put in the frig along with the broth and all the bones. We're a little excited here because we purchased a new camera yesterday that we have been looking at and saving for for some time. It is the Canon Rebel EOS T2. By the time we got the batteries charged last night we were done for day but the picture taking started first thing this morning. It is just so amazing. I had some nice shots of my dove before with my old camera, but look at this, you can see it's feathers. And look at the color and detail on the bluejay. This morning we awakened to a blue sky and the sparkle of fresh snow. 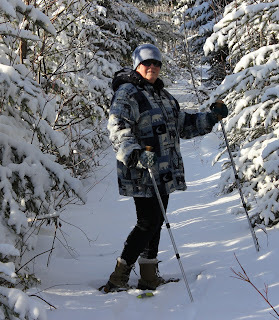 I just had to get out on my snowshoes for our first time this winter. 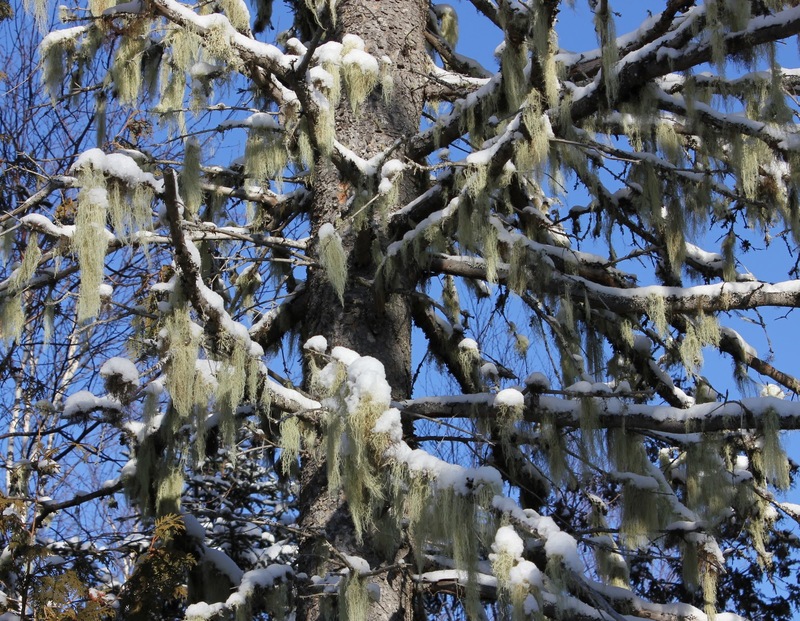 I love the white and green of the moss and snow against the wintry blue sky. I've been day dreaming about my next project. 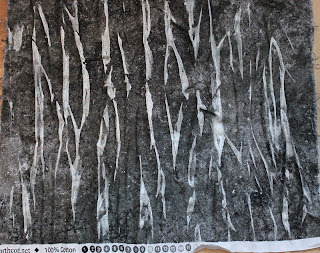 You may remember, I've been playing a bit with the birch tree image for some time, doing sketches and some thread painting. 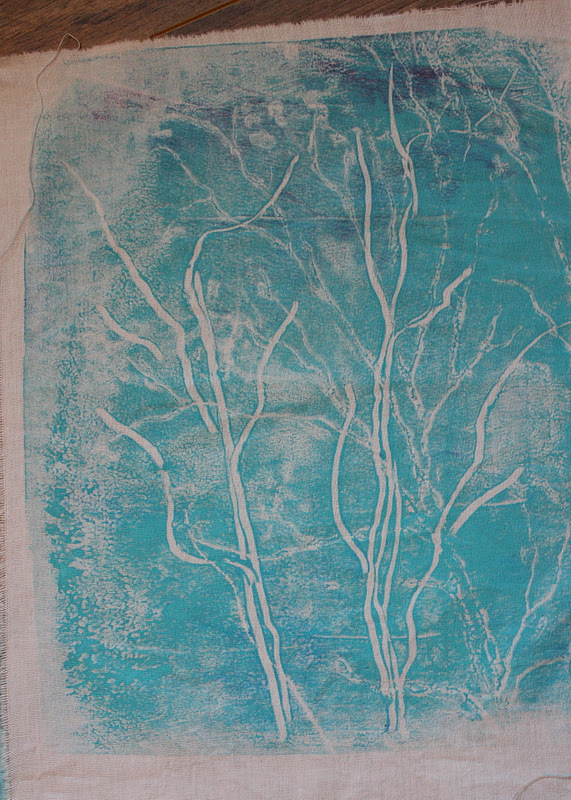 I've gathered together some fabrics that I might use, and I did this rubbing with a Shiva Paintstick. The rubbing is done from simple plate that I made some time ago with puffy paint. 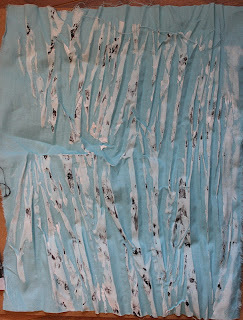 I sketched out birch trees onto a piece of corrugated cardboard with the puffy paint. It makes it 3 dimensional. You could also use white glue or Elmer's children's glue in blue. I used it today for the rubbing. 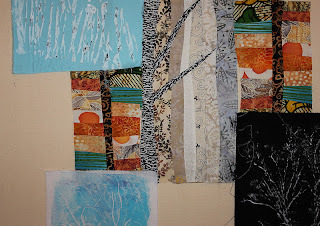 I'm thinking of using Rayna Gillman's method of free form piecing with some of my birch tree art. I jsut got home from my Friday errands and lunch with my friends. It is snowing, which is lovely, but the traffic was crazy and the grocery store was even worse. I hope I'm done all my errands now until next week. Amongst ornaments, and gifts from the kitchen, this was one of the gifts I received today. I also passed out a second mug rug yesterday. 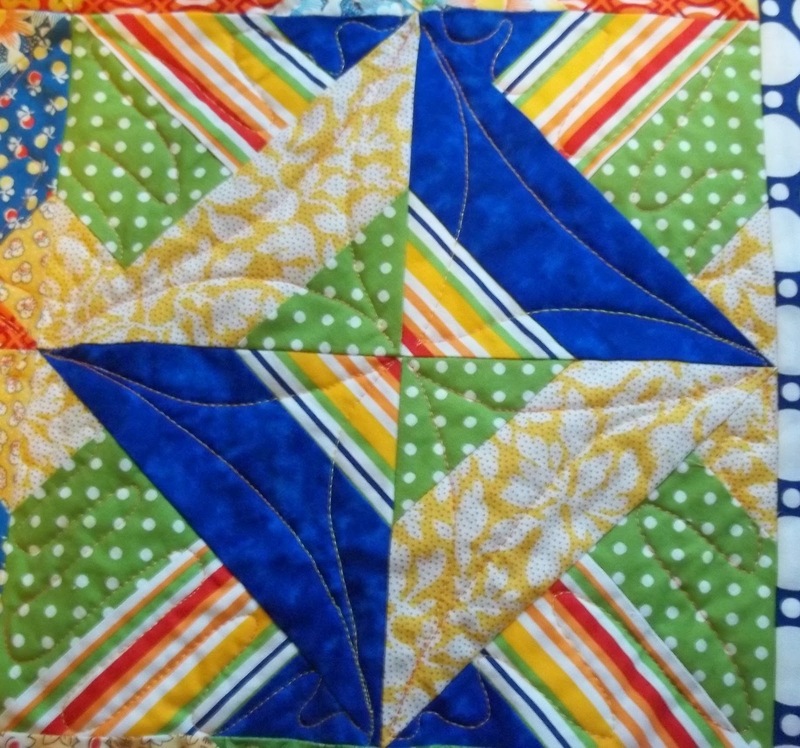 They are so much fun to make and especially fun to machine quilt. 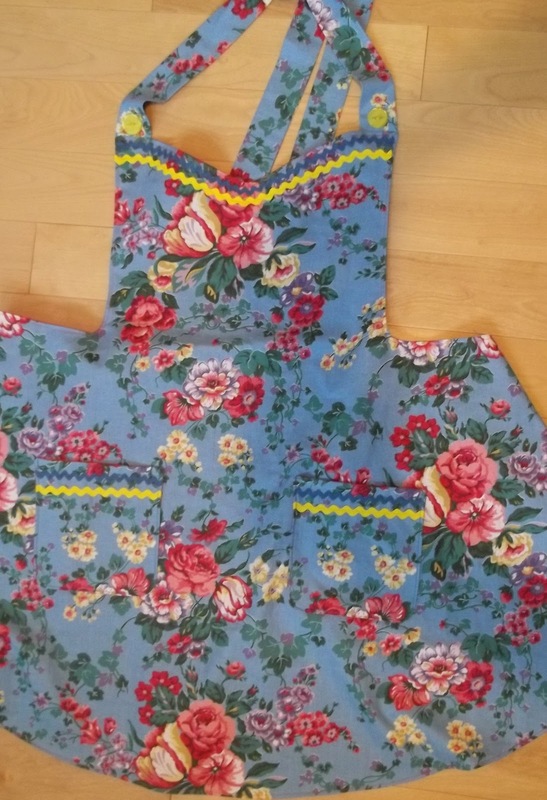 I found it very freeing to randomly piece it together; there's no agonizing over fabric choice since it's so small. I probably won't be blogging again now until after Christmas, so I'd like to wish everyone a Merry Christmas and a Happy Holidays. My friend again. It loves to hang out at the heated bird bath. Once when it was empty of water, it got right in it for a nap. I've been busy doing a little of this and a little of that. I'm not terribly rushed, although I've just started wrapping. I think I'll finish it comfortably. Yesterday, I made these 2 quick little gifts. The first is a little mug rug inspired by Exuberent Color's blog post. She made so many and I managed one; still I'm quite satisfied. I also made this potato bag for the microwave. 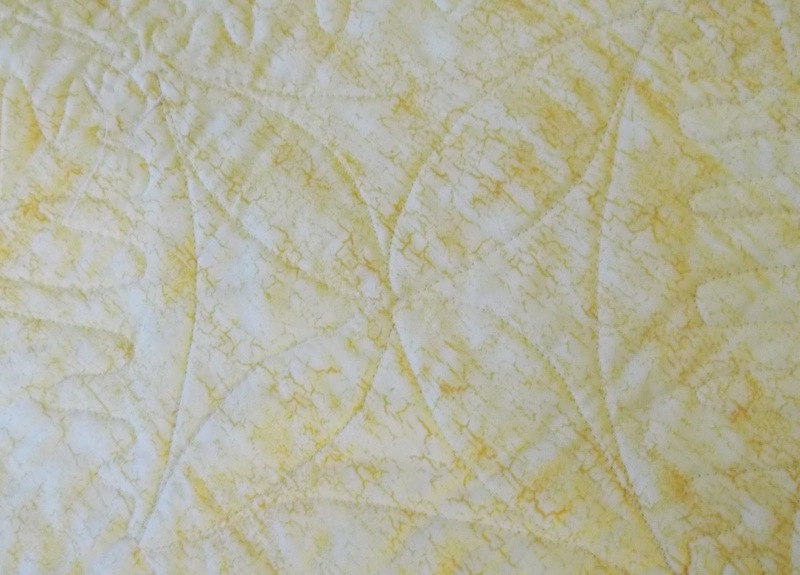 A quilting friend had one at our UFO day to microwave her potato, and I thought it was really neat. To make the small one I cut about 7.5 by 16.5 inches of a cotton print, muslin and cotton batting. Stitch them together envelope style and turn right side out. After stitching the opening closed and ironing, Fold it muslin sides together at the same time folding down a flap, right sides together for closing. The flap can the be folded over top for cooking. I haven't actually tried it yet, but the directions are to wash the potato, lightly dry it, no need to pierce, and microwave for about 3 minutes. 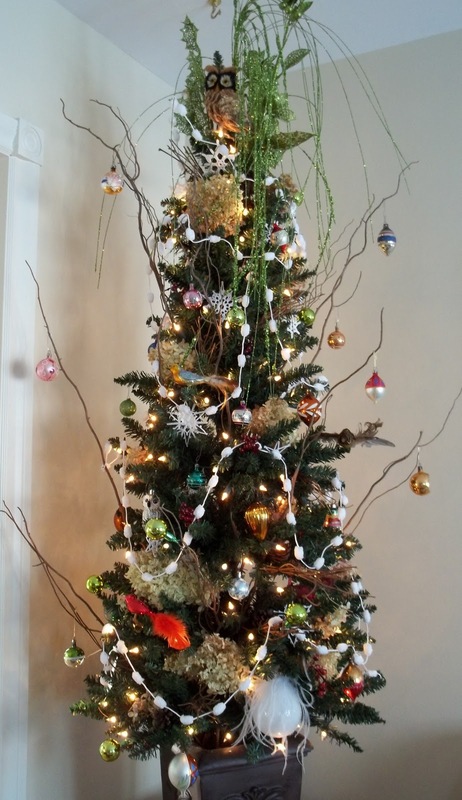 I got my little table top tree up and finished putting my antique ornaments and birds on it. The garland is actually a ball of specialty yarn. 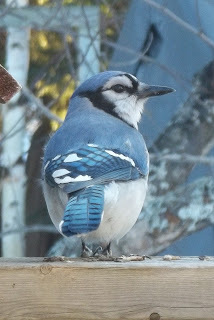 I have 2 bluejays that have finally gotten comfortable enough to stay awhile at the feeder. I so love their colors! Yesterday was UFO day for our guild; we have two a month and it's my favorite part of guild activities. 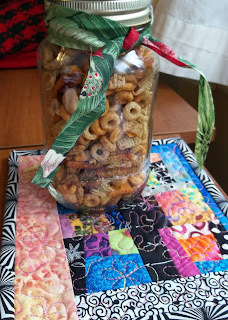 We had lots of treats since it was our last sewing day for this year. I was surprised at the good turn out at this busy time, and a lot of ladies brought their machines. Since I had a few bits of hand sewing left on some Christmas gifts, I brought my basket filled with those bits. One thing I finished was the binding and lights on my little snowman. I'm pleased with the colors. 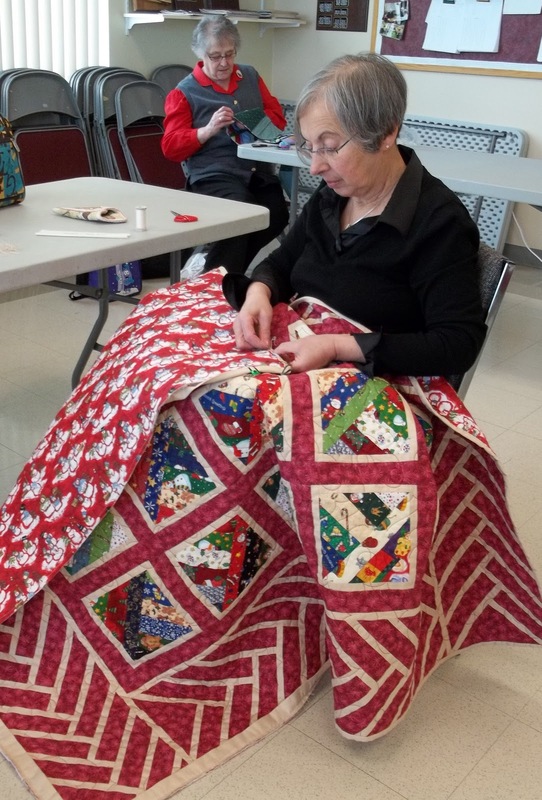 This is Nicole putting the finishing touches on her Christmas quilt. As one would imagine, on the week before Christmas, many were working on gifts. 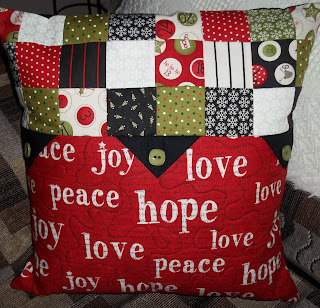 My friend Wendy was making pillowcases for various relatives. This one, for an aunt, features the red hat ladies. Always one for the last minute, she still has to put these in the mail! 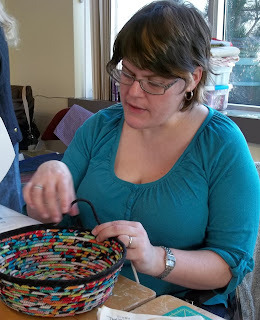 Another friend, Charlotte, was putting the finishing rounds onto a fabric bowl. The ladies, myself included, were all fascinated to watch her make one. She has a blog, Quilted Chaos, and a new Etsy shop where she's listed some of her fabric containers. 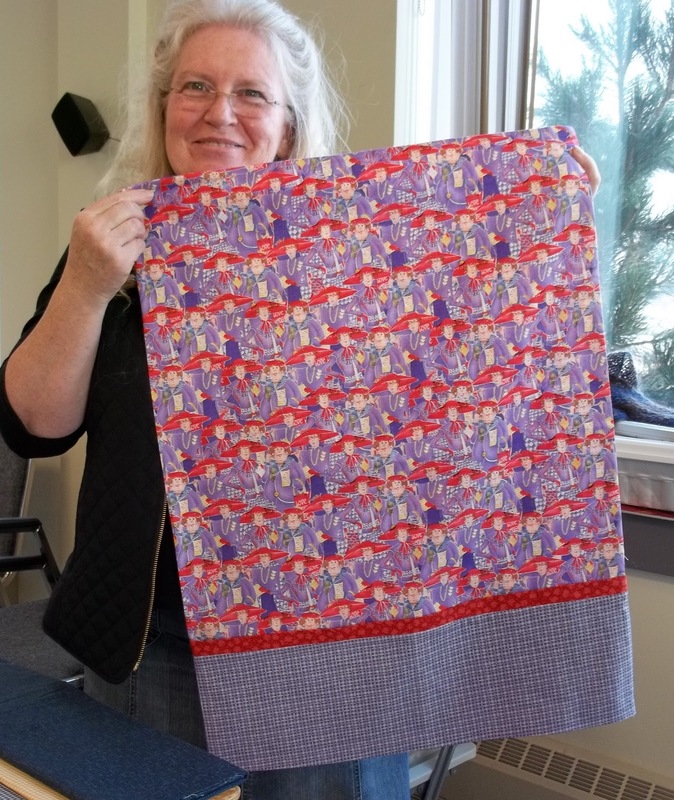 My friend Debbie must have been well organized with all her Christmas sewing done because she put together a quilt for Victoria's quilts which is an organization that sends quilts to cancer patients. This next picture is really out of context. 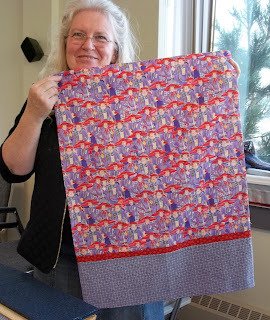 I had an email conversation with another blogger about postage stamp quilts. I've had one in my closet for a while that I pull out and do a few blocks on here and there. I have 6 blocks done set into stars and another 4 postage stamp blocks ready to go. 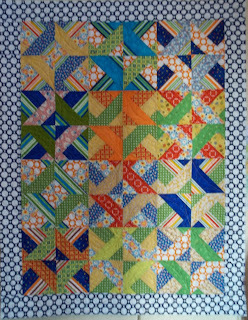 I'm thinking that I may do 12 blocks for the center of a quilt, adding some different borders around them. Perhaps I'll be inspired over Christmas to put a couple more together. Well, now I must go put a few ornaments on my tree, prepare a little dish for next weekend, and then I'm going to the Stars on Ice show this afternoon. My little snowman is ready for the hand sewing of the binding and a set of lights to be draped in its arms. I got the binding on this morning before I went the Auberge for my swimming. I don't know what it is with me and bindings lately. I had one on yesterday that I decided against. 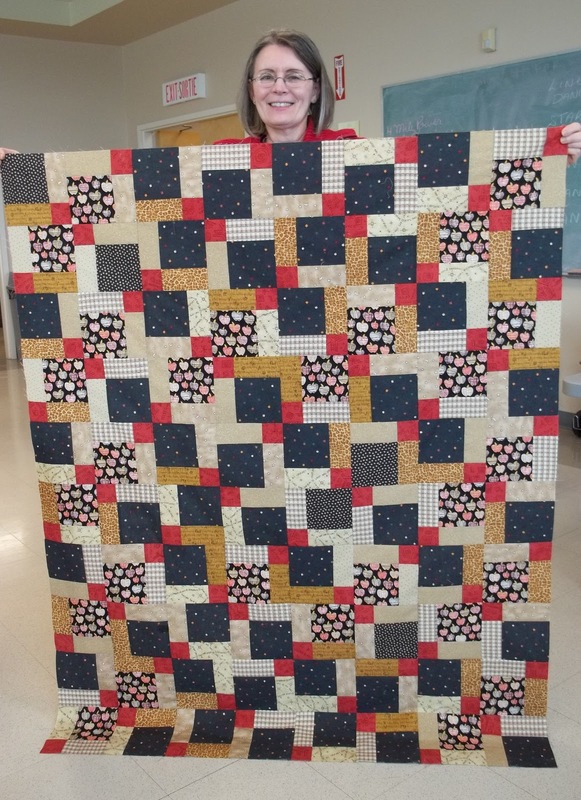 I had picked it out when I cut all the pieces out but when it came to the machine quilting, I chose a variegated pink thread as there was the tiniest dot of pink in the orange nose fabric. I forged ahead and sewed on the red binding and realized it didn't really match. I'm very happy withe this binding. 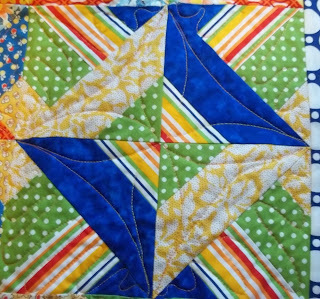 I also put the new border pieces on this little piece so I can hang it on my design wall and ponder how I shall finish machine quilting it and how I should embellish it with hand work. I'm not doing much baking this year because I will only have my son and his girlfriend for a couple of nights. If I can't lose weight without the sweets in the house, it won't be good to have them here. I do need a little something to take to my UFO day on Saturday though and thus far, I have only baked 2 things. These are chocolate oatmeal with dried cranberries and white chocolate chips. I didn't have quite enough oatmeal so I topped it up with coconut. 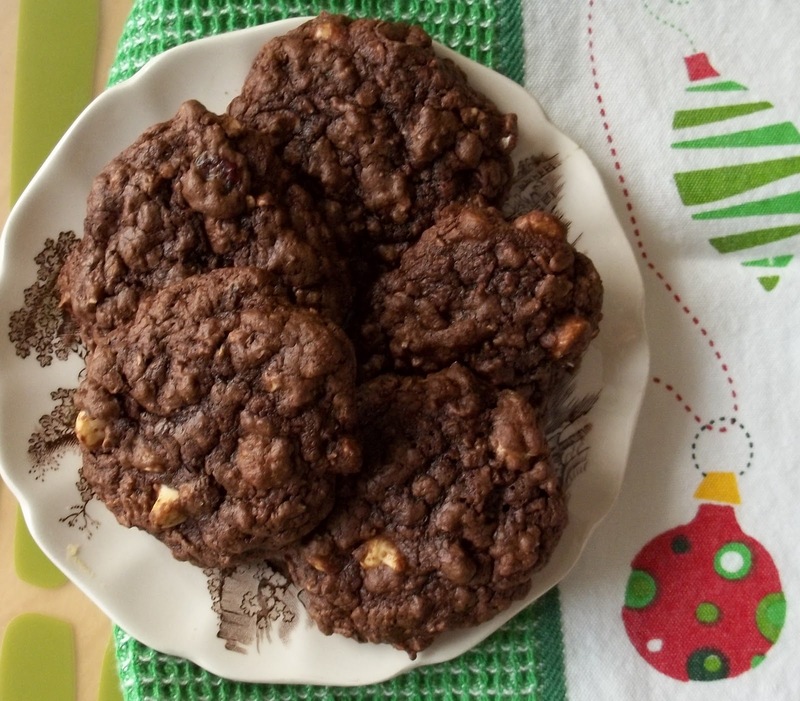 I cannot post the recipe because it's out of a book called Smart Cookies. After having a bit of a chat via Skype with my daughter in Korea this morning, I quickly got my bit of housework out of the way. Each day I've been putting out a few more decorations. 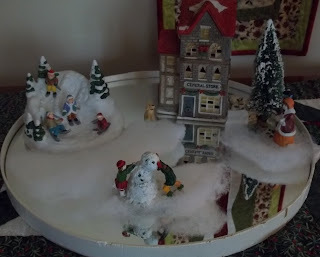 I've had a Christmas scene packed away for several years with no place to set it up, so I decided to put part of it out on this mirrored tray. I will just have to move it for Christmas dinner. I was looking for a small gift for someone, and I thought of this little hanging that I've made a couple of times. It's called Hangin' Lights by Patch Abilities. It's only 5 1/2 by 19 1/2 so it's a pretty quick project. 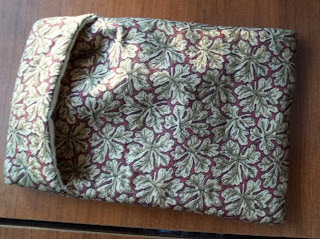 I usually like to do a hand sewn blanket stitch but I used my machine this time. 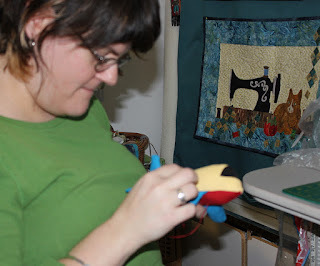 Although I don't actually have the blanket stitch on my machine I've used this stitch before. 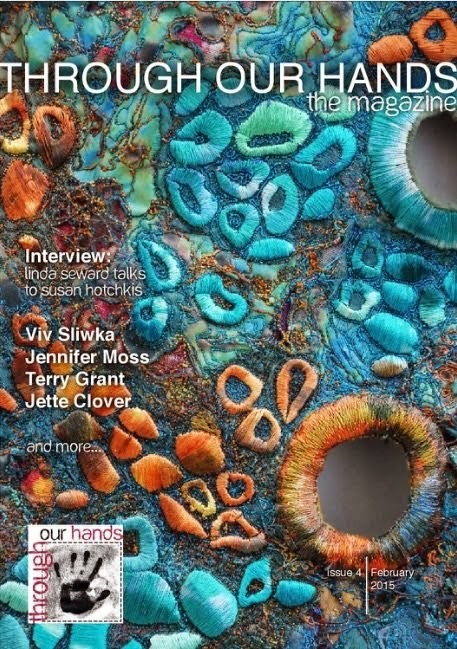 I think it might be the hem stitch. 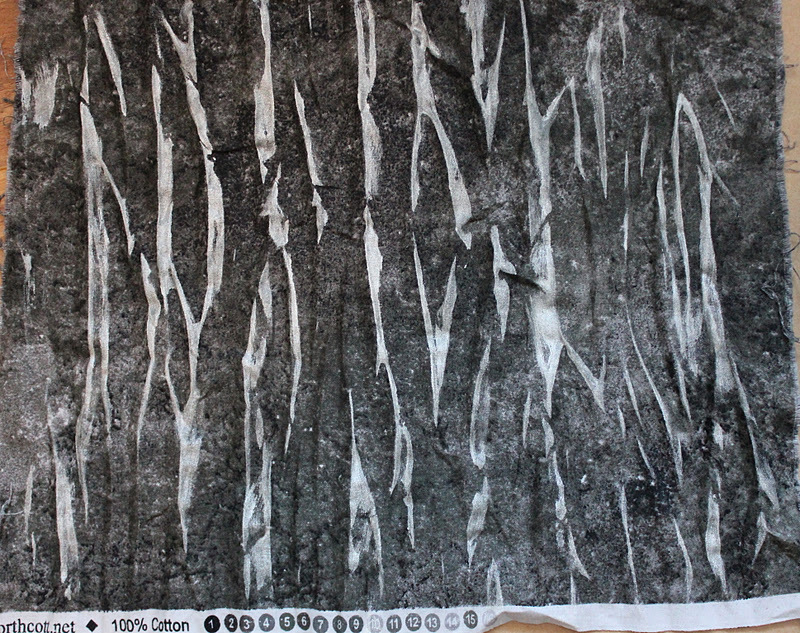 If I set the machine to a very small stitch width, it works pretty well. 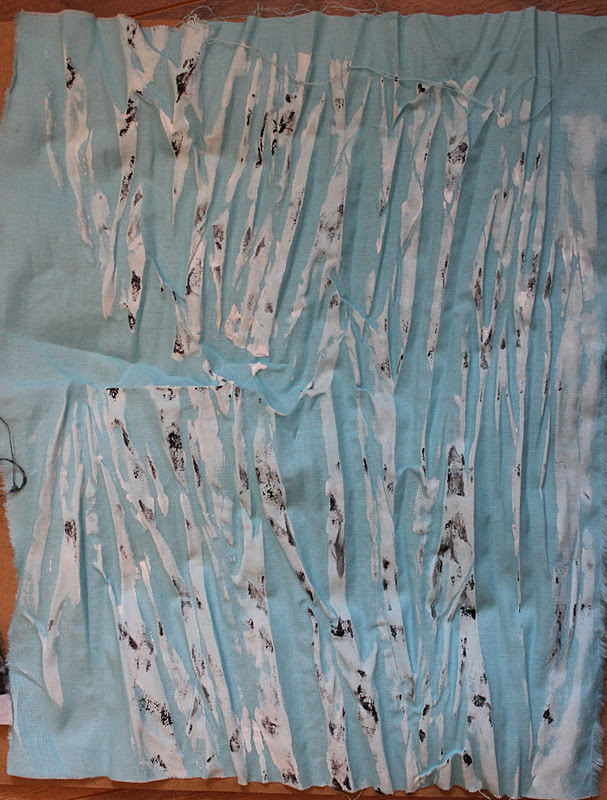 It seems to have puckered a bit so I will add some free motion quilting around the snowman to flatten it out. The snowman is supposed to be holding a string of lights. I shall have to look around to see what I have. Here is my friend again. I've done no sewing today. We went to visit my in laws. Gord's mom just bought herself a laptop. They have not yet gotten connected to the net, but we showed her some of the simple things she could do like loading her photos onto it. She's 75 so it's very exciting. Also, my mom, who is the same age, just bought herself a Notebook and is learning to email. 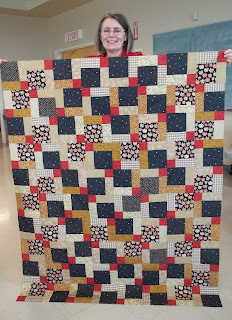 I finished the machine quilting on this last night. 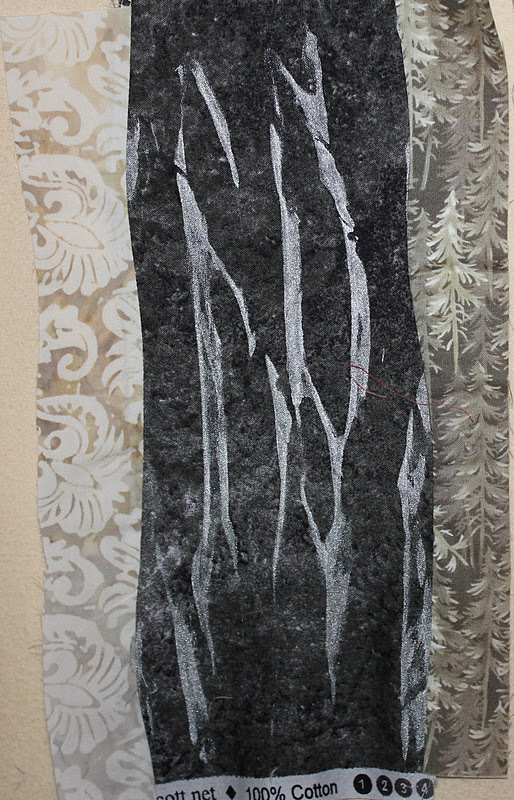 Now, I have to sew in the threads and get the binding done. 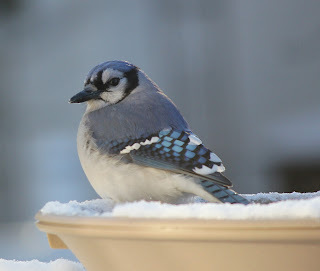 Some of you may get sick of this if you're not a bird lover. 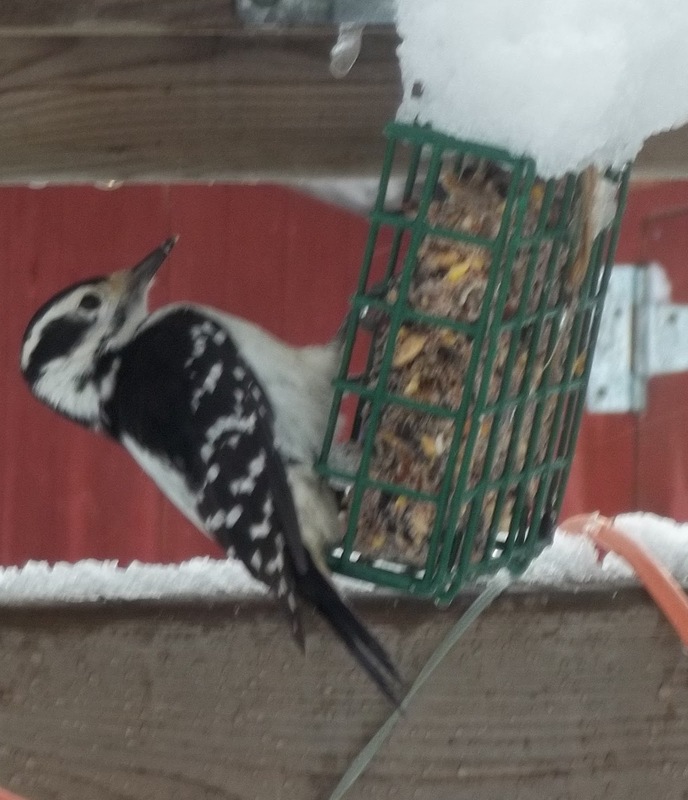 In winter, I will often post pictures of the visitors to my deck feeders. 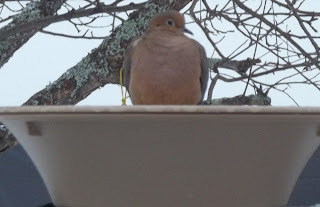 It has been a few years since I've had a dove at my feeder, and this one has been staying around for most of the day. I feel as though it is watching us through the window. I've just had a couple of very down days, feeling pretty fatigued with nausea and heart palpitations. Stress is very hard on a person with Addison's, and it's not always easy to know when an extra dose of cortisone is needed. I felt better today though. 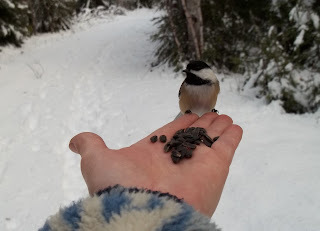 Gord and I went for a walk down the NB Trail and I took the time to stop and feed the chickadees and even a nuthatch. The nuthatch is even smaller than the chickadee. You can hear it coming as it makes a funny little squeak. 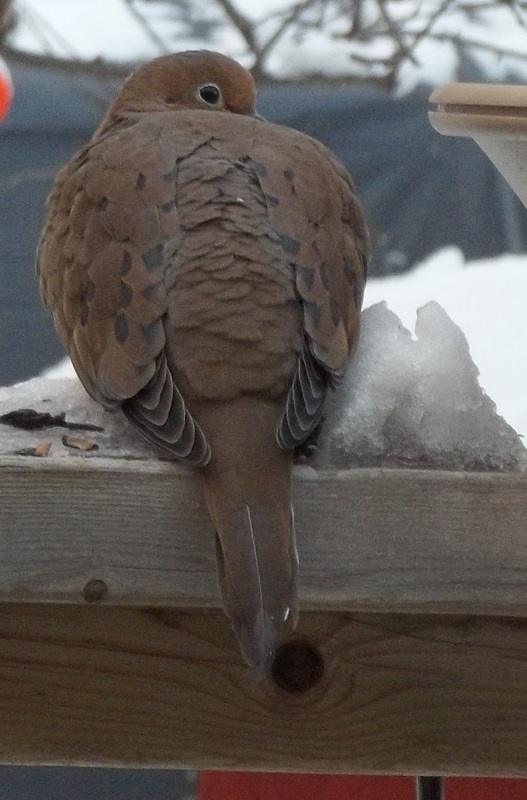 When we went into the house we found this mourning dove sitting and looking at us through he kitchen window. I find doves so beautiful. 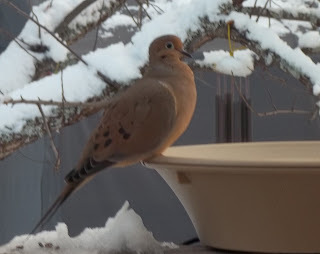 It is sitting on the rim of the heated birdbath that my son gave me one Christmas. 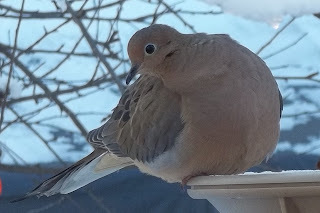 I've spent much time peering through my window at the various birds that use it. These little friends of mine give me a real sense of peace. My day started with the best of intentions, as I lay abed thinking about the storm we were getting. I wouldn't be going anywhere today. On my list was Christmas pudding and finishing the machine quilting on my baby quilt. 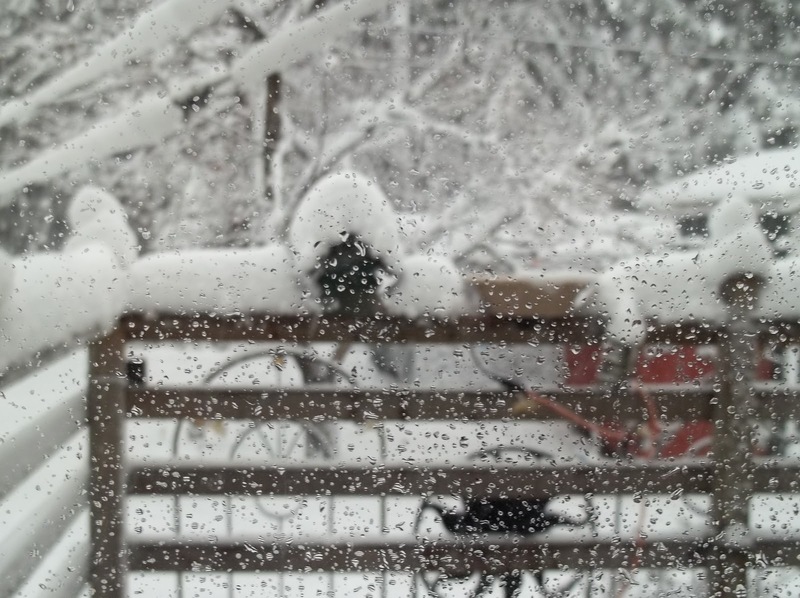 This is what my kitchen window looked like this morning. After spending the day in the car yesterday, I was feeling fatigued and foggy brained at breakfast. While trying to clear my head, I put out a few of my Santas that I have made and collected over the years.. 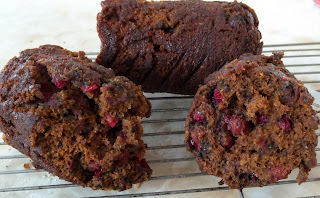 The Christmas pudding recipe was given to me by a friend last year, and I knew it was easy enough to do despite my foggy brain. 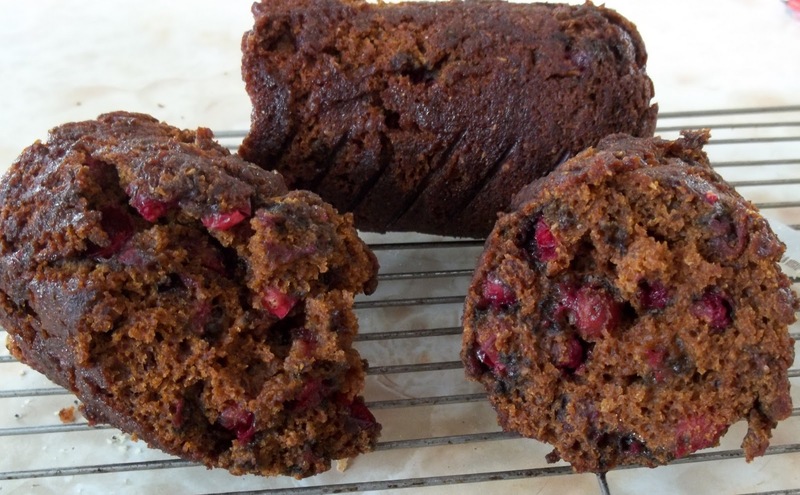 It is a very simple steamed pudding that I put into tin cans which go into a covered pot on top of the stove. Apparently they have changed the bottoms on some cans. Usually I take the can opener to the bottom once cooked and simply push the loaf out. However, the opener wouldn't work on these ones, so I had to coax them out the top. As you can see one broke. When it started to clear this afternoon the female downy wood pecker was back at the feeder. 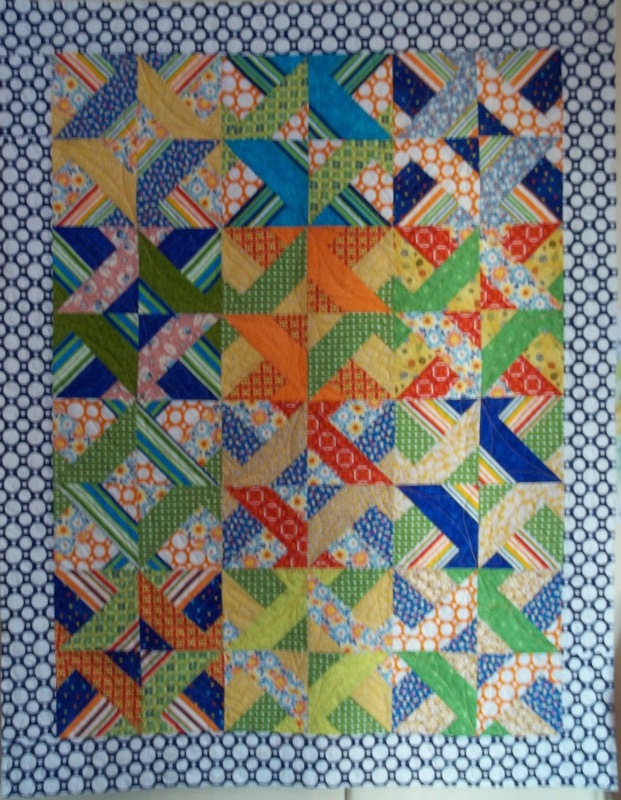 I managed to get the main part of the quilt done and started on the borders after lunch. I chose to do circles to mimic the polka dots. I realized when I finally got the first side done that it would take some time. Perhaps I should have chosen a looser simpler design. That idea became reality when I realized that I had caught up t he backing for about 10 inches. Well, normally it's not too hard to pick it apart and re do the section but, with the circles I had gone round them a couple of times. I will have to pick apart the whole section or it will look terrible. I'm tempted to pick it all out but I'm already more than half way around. My other project is also in the midst of change. 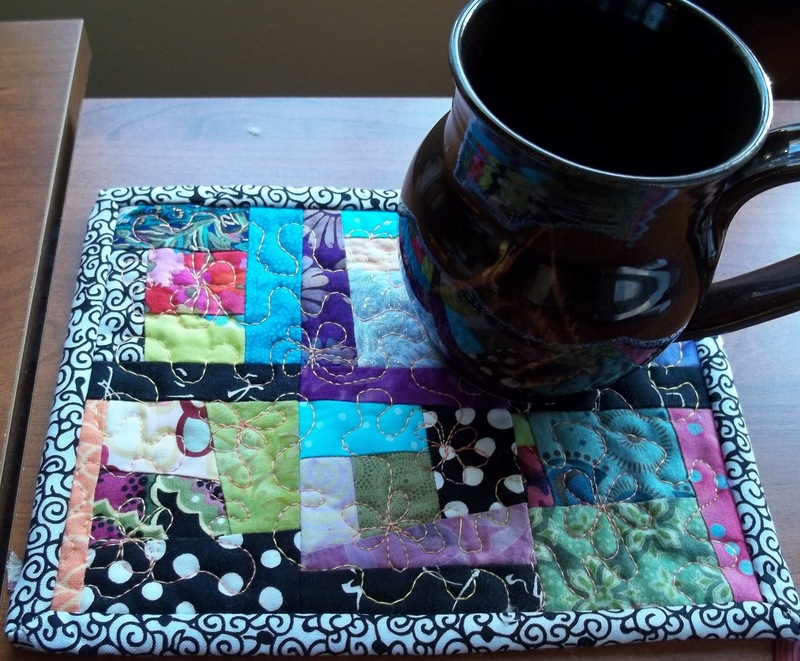 I did sit with my cup of tea and pick the first borders off. Now I'm auditioning 2 more. I really think I'll go with the one on the top. It was my first choice. 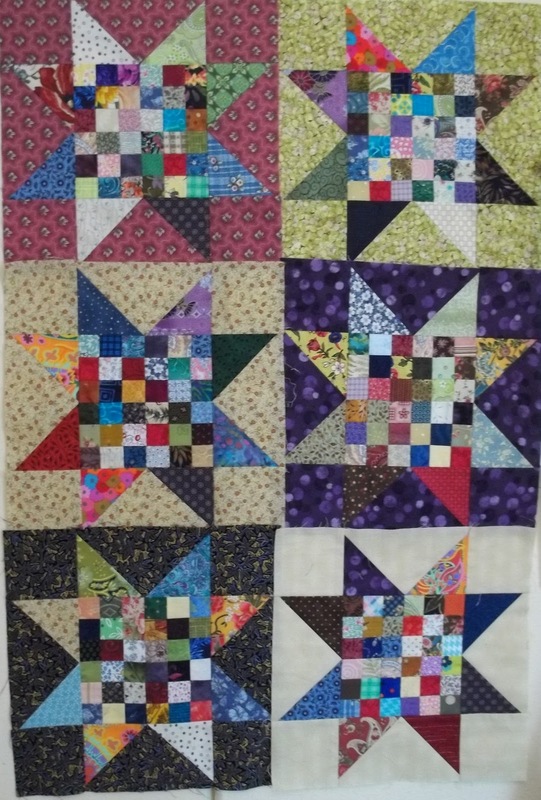 I'd like to get at it, however, my sewing machine is all set up for machine quilting; I guess I'm just going to have to sit and start picking out the stitches. I'm thinking positive! It's not about what gets finished, right? 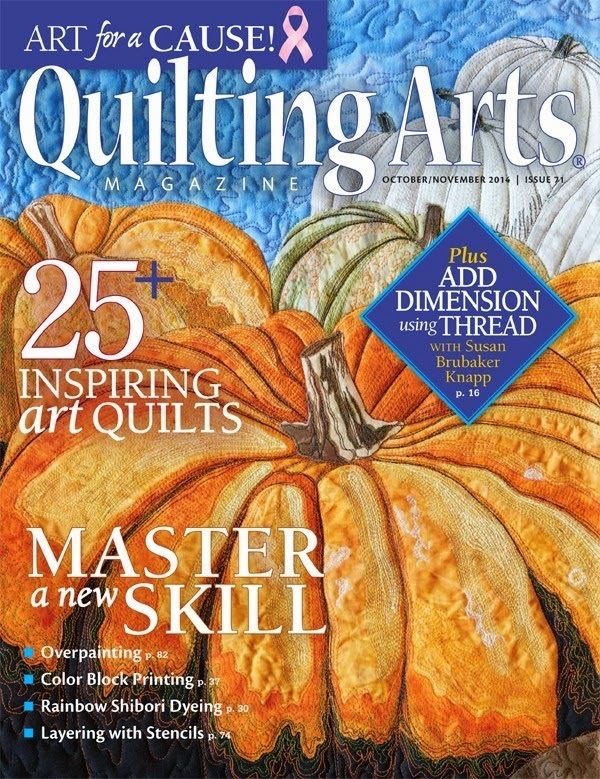 I need to sit quietly with the seam ripper, the quilt in my lap, and relax. We just got in from a round trip to Moncton (about 2 1/2 hrs one way) to get our car fixed. Despite an iffy weather forecast the roads were good both ways. Once we got within an hour of Bathurst the landscape turned white but the roads were clear. Last night was our guild Christmas dinner and a lucky night for me. Some of the members were ready to ban me from the draws though. 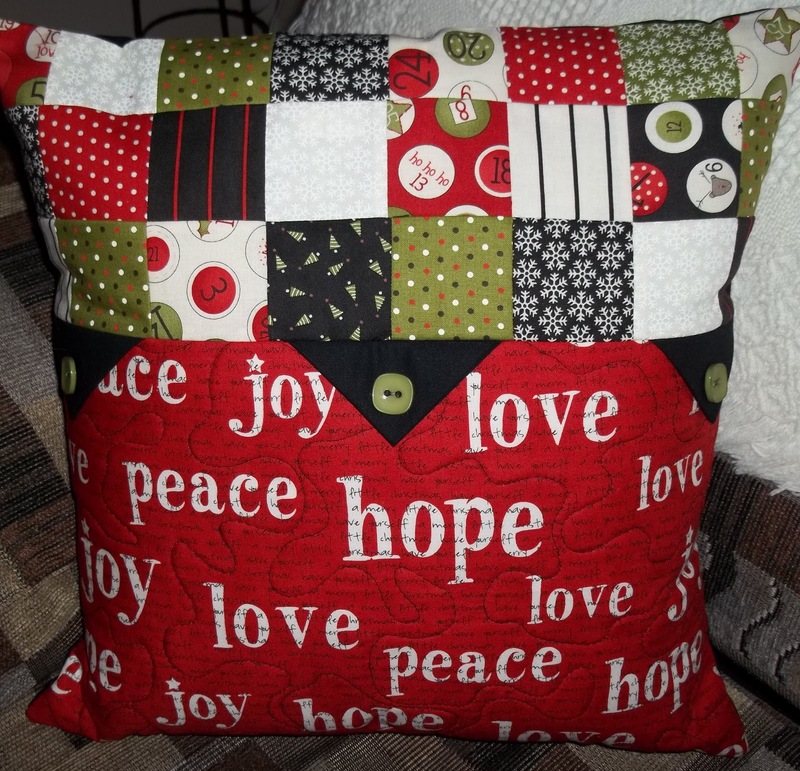 First there was a draw for this lovely Christmas pillow made and donated by a friend of mine. I was so excited when my numbers matched. Then on the very next draw I won again, a bag of matching Christmas fabric. And just the day before I got an email form The Red Door Studio announcing that I had won her draw for this new book by Janet Clare. It's been a busy couple of days . All that I have to show is the machine quilting that I got started on my baby quilt. I was pleasantly surprised by the design taht resulted on the back. It's actually a little deeper yellow. I had trouble getting a picture that showed the stitching. I'm about 3/4 finished, so if it's a snow day tomorrow as they're forecasting I may get it done. 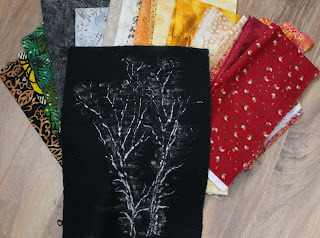 I'm linking to WIP Wednesday.